Summary:The Medical Research Council (MRC) and the São Paulo Research Foundation (FAPESP) are pleased to invite proposals to the UK-São Paulo/Brazil Neglected Infectious Diseases Joint Centre Partnerships Initiative under the umbrella of the Newton Fund. Thematic project funding scheme (www.fapesp.br/en/13). Researchers associated with public or private Higher Education or Research Institutions in the State of São Paulo are eligible to apply to FAPESP, following criteria related to the Thematic Project scheme. São Paulo applicants must contact FAPESP to confirm their eligibility for the call before developing the proposal. Proposals must be submitted to FAPESP via SAGe and to MRC through Je-S. The Medical Research Council (MRC) and the São Paulo Research Foundation (FAPESP) are pleased to invite proposals to the UK-São Paulo/Brazil Neglected Infectious Diseases Joint Centre Partnerships Initiative under the umbrella of the Newton Fund. This initiative will provide funding for high quality collaborative Joint Centre Partnerships focussed on addressing Neglected Infectious Diseases in Brazil. MRC will make up to £3.5m funding available for this initiative, with equivalent effort matched by FAPESP. Researchers planning to submit to this scheme are asked to submit a short expression of interest form to international@headoffice.mrc.ac.uk by 8 June 2018. Please see further details below. Enhancing existing partnerships and developing new partnerships between the UK and São Paulo-Brazil in the area of Neglected Infectious Diseases. Supporting the mobility and exchange of UK and Brazilian researchers to enhance links between researchers in both countries. Strengthening the strategic relationship between the UK and Brazil. Neglected Infectious Diseases are a group of diseases, caused by parasitic, bacterial, fungal, ectoparasitic or viral agents that cause substantial illness for more than one billion people globally. They are so named due to the lack of large investment into the development of new drugs and vaccines to prevent their transmission and minimise their effects, and because existing programmes to control these diseases are not sufficient. According to the WHO, several of the world’s major Neglected Infectious Diseases occur in Brazil, with differing burdens between regions. In October 2014, the MRC, the Economic and Social Research Council (ESRC), and the Brazilian National Council of State Funding Agencies (CONFAP) hosted an Infectious Diseases workshop in London. This workshop was attended by eminent Brazilian and British researchers in the field of infectious diseases in order to scope the development of a future Newton Fund call. The outcome of this workshop was that the call should focus on neglected infectious diseases of relevance to Brazil but not be constrained in terms of the type of biomedical or social research. In May 2015, the funders launched the UK-Brazil Neglected Infectious Diseases Partnership through which 13 new partnerships were supported aimed at tackling diseases such as zika virus, leishmaniasis, schistosomiasis and leprosy. Building on the success of these initiatives, MRC and FAPESP are announcing the launch of a second UK-Brazil initiative on neglected infectious diseases under the umbrella of the Newton Fund. Through this initiative, the funders are seeking to provide substantive support for UK-São Paulo collaborative joint centre partnerships to address neglected infectious diseases of relevance to Brazil. The launch of this call occurs in the context of the UK-Brazil Year of Science & Innovation 18/19, a yearlong celebration of existing science and innovation partnerships between the UK & Brazilian government. The objective is to deliver significant three-year research funding for internationally competitive and innovative collaborative partnerships between researchers from Brazil and the UK to enable the pursuit of shared research interests. Proposals with a focus upon HIV, TB and Malaria have been excluded from this call. However, the expectation is that proposals will tackle key research question(s) of relevance to addressing these diseases specifically in the Brazilian context. Beyond the expected outputs regarding the publication of scientific articles, thesis and dissertations, projects funded under this scheme should have scientific outcomes of relevance to the development of approaches addressing the prevention, treatment, diagnosis or control of neglected infectious diseases in Brazil. Given the funding available, it is not proposed that the research will involve large scale efficacy trials. 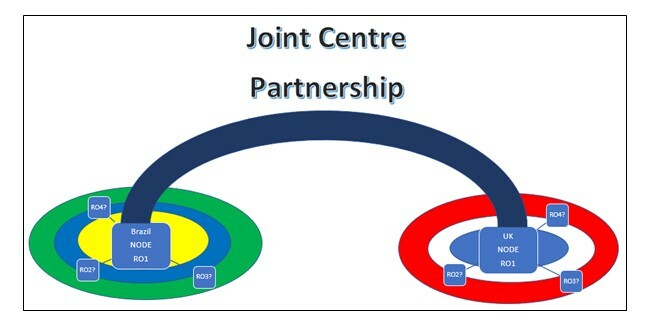 A Joint Centre Partnership (JCP) is not a physical entity, but rather an agreed collaboration and a way of working together. The Centre Partnerships will be jointly funded by the UK and FAPESP. Each JCP will have one node in the UK and one node in São Paulo-Brazil. The two nodes in each JCP may comprise of a group of investigators based in a single academic institution, or a wider group of investigators at more than one institution, but who will be co- ordinated through the national node. Both of the nodes in a JCP will provide intellectually stimulating environments and maximum knowledge transfer capabilities: facilitating excellent collaborative research. They will also have an important role in capacity development in a focused area, developing outstanding researchers with specialist and transferable skills. Each JCP will deliver a core research programme supported by a range of partnering activities. Where applicable, project partners should align existing resources and infrastructure to augment their research programme. It is anticipated that the two nodes within the centre partnership will provide complementary skills and expertise and/or will jointly provide a coherent critical mass that will drive a step change in research. The JCP will ensure cohesive working to deliver the planned research through strong governance and a robust overall management strategy. a) Research staff exchanges, including short and longer term visits, exchange of PhD students, post-doctoral researchers and visiting fellows. b) Enabling the sharing of key resources across the partner centres (for example datasets, training guides, protocols for data collection and management) across the partner institutions. c) Supporting wider activities to strengthen links, for example holding symposia, workshops, seminars, meetings etc. d) Joint impact and knowledge exchange. e) Outreach activities, which may include engaging stakeholders, the public, decision makers, policy makers, industry etc. f) Open access of data and outputs. Please see the scheme specific guidance document for details on what must be included in the case for support. a) Resourcing for programme management. b) The establishment of adjunct faculty positions at the partner centres. c) Establishment of specific faculty positions at partner centres or shared directors. FAPESP will provide this grant through the FAPESP Thematic Project funding scheme, eligible items are listed in Thematic Projects Guidelines. Exceptionally under this opportunity, proposals may be financed for a period of up to 3 years. MRC will make up to £3.5m funding available for this initiative, with equivalent effort matched by FAPESP. The size of the grants will vary according to the needs of each centre partnership. UK and Brazilian applicants do not need to request equal amounts from both sides. The difference in values should reflect the difference in costs covered and local prices. The agencies also expect the costs on each side to accurately reflect the research effort to be carried out. It is expected, however, that the research effort on both sides should be comparable. We would not expect a centre partnership to request over £1.15m from the MRC. MRC will provide funding for the UK node under standard arrangements and at 80% FEC. FAPESP will provide funding for the Brazilian nodes located in the State of São Paulo according to the FAPESP funding guidelines. Please note, up to 10% of the UK budget may be used to cover the costs of Brazilian researchers based outside of the state of São Paulo - as with all costs these must be carefully justified. Please note the MRC would not expect to cover salaries as these are typically covered by the Brazilian researchers’ host institution. Standard MRC overseas cost reimbursement rates would apply (i.e. 100% fEC). For further details, please visit the MRC Applicants Handbook. Projects must be three years in length and start on or before 1st April 2019, and have completed by the end of March 2022. Please refer to the MRC Applicants Handbook for information on what the starting procedure entails; please inform the relevant support staff in your organisation of this requirement to ensure the project starts on time. This call will fund partnerships between UK and the State of São Paulo, fostering relationships between researchers working in the area of Neglected Infectious Diseases. Researchers must be from higher education and research organisations, public or non-profit from the State of São Paulo. Funding will be granted in the Thematic Project scheme and its eligibility requirements as stated here. Applicants from Sao Paulo will have their eligibility confirmed by FAPESP upon submission of the expression of interest. The funders are not seeking to fund partners outside of the UK and Brazil through this initiative. Please contact international@headoffice.mrc.ac.uk if you are planning to involve a partner from a third country in your proposal. In addition, applicants must describe how the proposed research is ODA compliant [approximately 150 words]. This section may be made publicly available. For further information on ODA, please see the guidance. All applications will be externally peer reviewed, and all applicants will be offered the opportunity to provide a written response to those reviews. Following this process, applications will be assessed by a joint MRC-FAPESP Review Panel in November 2018. 2) a curricula summary from the Sao Paulo based PI as described in www.fapesp.br/sumula. Please email your completed form and ‘curricula summary’ to the following address: international@headoffice.mrc.ac.uk. FAPESP will issue an eligibility letter for the Sao Paulo applicant by 18 June. UK and Sao Paulo applicants must apply separately to their respective funding agencies by Thursday 19th July for the funding component requested within each country, but this must be based around a common research plan and vision. Both partners must therefore submit an identical joint Case for Support written in English. Failure to submit a valid application to both sponsors will invalidate both submissions. Brazilian Principal Investigators must submit an identical case for support written in English to the FAPESP via SAGe. Additional guidance for Sao Paulo Researchers can be found here. UK applicants must submit to the MRC via JeS. The JeS submissions must be received by 4pm BST on the day of the deadline. Applications from the UK Principal Investigator should be submitted to the UK Research Councils’ Joint electronic Submission (Je-S) System. UK applicants must complete all sections required for a standard Research Council Grant proposal. Please also fill in and submit the UK-São Paulo Justification of Resource form. UK applicants should upload this under the attachment type ‘Letter of Support’. Pathways to Impact and Data Management Plan documents must also be attached to the Je-S application. For further information, please read the scheme specific Guidance for Applicants to the UK- São Paulo/Brazil: Neglected Infectious Diseases Joint Centre Partnerships. Further guidance can be found in the MRC Guidance for Applicants. The Newton Fund through science and innovation partnerships promotes economic development and social welfare of partner countries. It is a £735 million Fund, now extended to 2021, which has matched resources from the 15 partner countries: Brazil, Chile, China, Colombia, Egypt, India, Indonesia, Kazakhstan, Malaysia, Mexico, Philippines, South Africa, Thailand, Turkey and Vietnam. By collaboratively working together on bi-lateral and multi-lateral programmes with a science and innovation focus, the UK will build strong, sustainable, systemic relationships with partner countries. It is managed by UK Department of Business, Skills and Innovation (BIS) and delivered through 15 UK delivery partners: Research Councils, National Academies, British Council, Innovate UK and Met Office, working closely with partner countries’ funders. For more information visit the Newton Fund homepage and follow via Twitter: @NewtonFund.